Jump for Joy and Live out Loud! – It Works For Bobbi! Jump for Joy and Live out Loud! Published on July 16, 2008 August 9, 2016 by Bobbi-Jo G.
In my goal to stay caught up, I had to definitely scrapbook these fun photos from our weekend trip to MooseJaw, SK. I’m not sure what madness motivated me to take the leap out from behind the camera in order to jump off the side of a fountain in FRONT of the lens, but I did…. and (shhhhhh) I liked it! Not only that, but it wasn’t long before all the kids (my hubby included) wanted to do it, too! Soon we were a bunch of jumping maniacs!! I was so excited to scrapbook these, and I stuck with regular size 4X6 photos for both layouts. In this layout, I used 3-D adhesive squares to make the center photo stick out just a bit. I did the title and journaling block in Microsoft Word (by creating a text box and filling with the color I wanted). So fun! 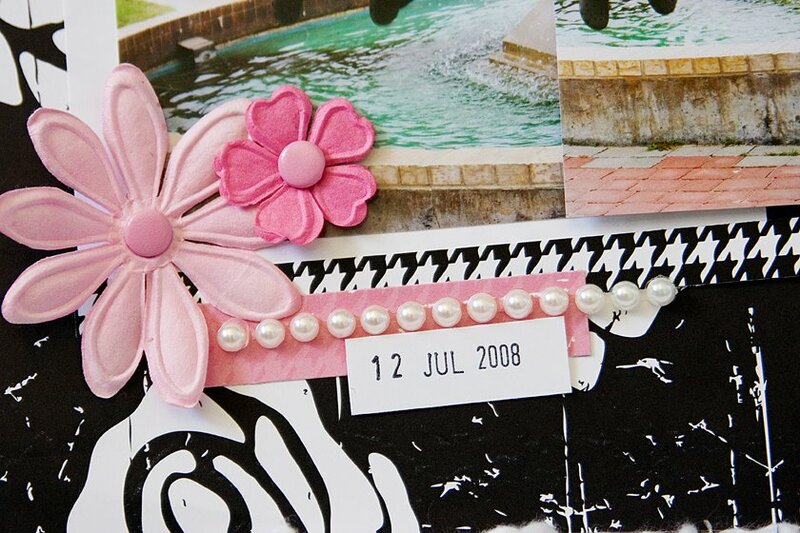 My favorite part of the layout is the fun pearls you can find here and there on the layout. I got these self-adhesive pearls from Michaels. Look at these photos – are we a little crazy? Yeah… crazy like a fox. Okay, that didn’t work. 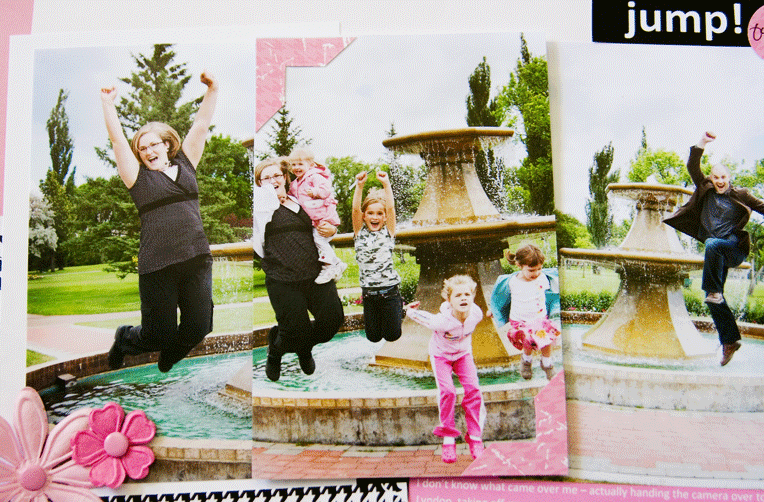 For the second layout, I featured just the photos of my girls jumping. I just LOVE B’s splayed out arms like she’s about to take flight. LOL! And just look at the air TJ’s getting!! For something a little different, I painted a couple of chipboard brackets black, then rubbed a gluestick over them (one that dries clear) then sprinkled some clear sparkles on top. I love the fun look it gives the layout. I’ll be posting all about our trip in a few days. I haven’t had much time to look through all the photos yet, (except of course these ones….I couldn’t WAIT to see how the jumping ones turned out. LOL!). 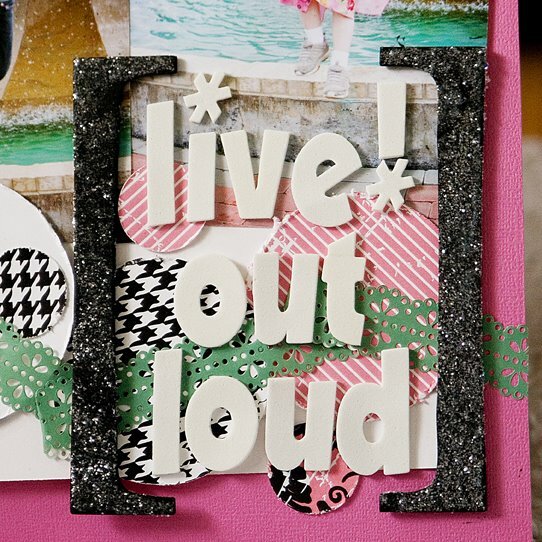 Great layouts – that’s some “air!” Love the pink! & the glittered brackets are great too.What were you doing in Moose Jaw? your talent is SO amazing! Just to ‘whip this up’ like that?! I am envious. You rock. VERY CUTE PAGES!! I think that is awesome you got in front of the camera and joined in on the fun! 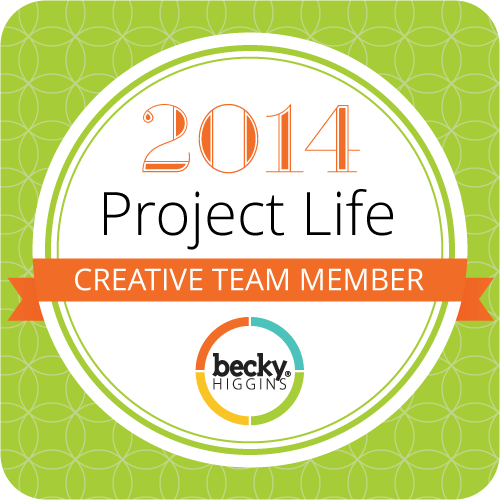 You definitly deserve to be a part of your pages as well as your kids albums! Love it…and the color scheme is too cute. Great stuff. You guys look cute! Love those layouts! Some of my favorite colors.